I’ve had the Diptic app on my iPhone for a while now, but never used it. IPhone photos are so small, I didn’t see the benefit, especially for posting on Instagram. Then I realized I could use it to display instagrams on the blog. . . . The first and last photos were taken at an old ranch; the second at the beach, and the third in our backyard. We have a beautiful giant bird of paradise that’s doing really well. It hasn’t flowered yet, but hopefully this year. The Diptic app is very easy to use. You just select a layout, then the photos you want and Diptich does all the rest. There are may layouts to choose from, but I think I’ll stick to the standard two- or four-photo ones. 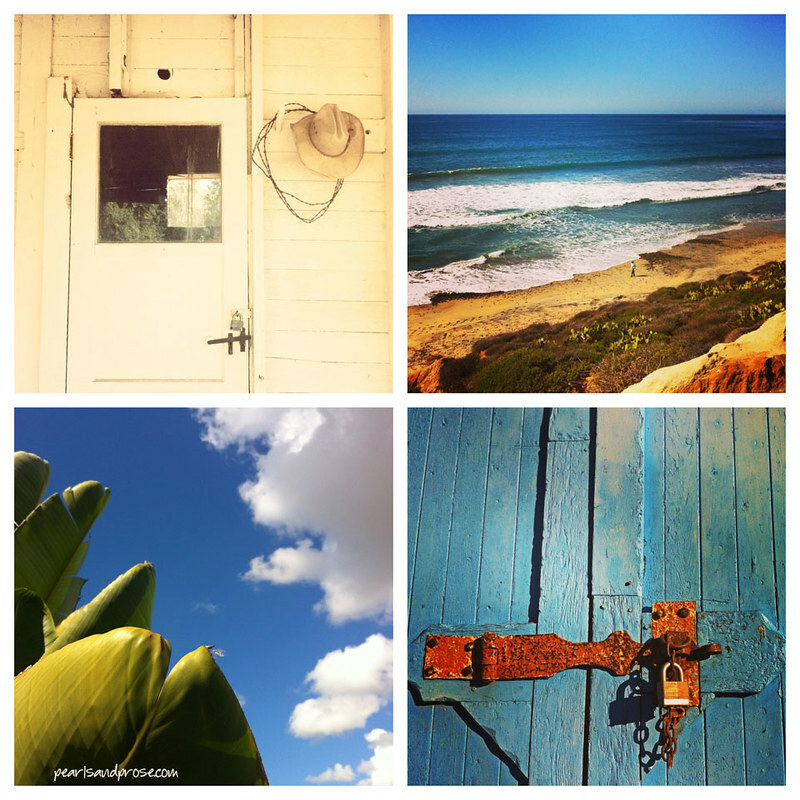 This entry was posted in photography and tagged beach, blue door, California, cowboy hat, Diptic app, Giant bird of paradise, Instagram, padlock. Bookmark the permalink. Beautifully photos. I’m particularly fond of the door. Thanks, Caroline. I like the door too. It’s from an old barn. Thanks for the tips about this app. I think I’ll give it a try. Sometimes I like to have a photo collage rather than listing them one after the other on the blog. This is a very nice presentation. I’m always amazed by the wonderful photos you take with your iPhone. Mine all look like I was photographing a paper bag. Ha. I don’t believe that, Jackie! IPhone cameras can be tricky for sure. I never really know what I’m going to get, but that’s fun for me. Fantastic results, Carole … still envious of your iPhone! You have a Droid, right, Cheryl? I’ve heard awfully good things about them. I have a Samsung … is that a Droid, Carole. So that question is clue to my app-ability! I’m glad you decided to experiment, these photos are all beautiful, but put together like this they’re even better!